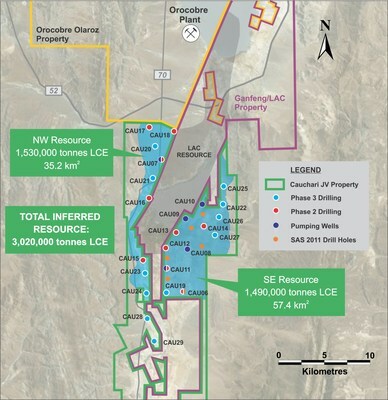 VANCOUVER, Nov. 27, 2018 /CNW/ - Advantage Lithium Corp. (the "Company" or "Advantage Lithium") (TSX Venture: AAL) (OTCQX: AVLIF) is pleased to provide this general update on activities at the Cauchari JV property located in Jujuy Province, Argentina. The Phase III infill drilling and resource conversion program is close to completion in the NW Sector and continues in the deep sand unit in the SE Sector. The program is currently on track to upgrade the current Inferred Resource to Measured and Indicated Resources by early 2019. Drilling of holes CAU28 and CAU29 completed to extend the NW Sector resource area further south, increasing it by ~20%. Drilling identified the presence of an extensive (>300 m thick) sequence of sand and gravel in the southern continuation of the NW Sector. Constant-rate pumping test underway in CAU11 to simulate long-term production; CAU07 pumping test to begin within 2 weeks. President & CEO Mr. David Sidoo commented: "I am very pleased that the current Phase III drilling program has expanded the footprint of the resource area, as we rapidly progress towards updating the current resource to Measured and Indicated categories. The current constant rate pumping test that will be completed on 25th November is progressing as planned and providing important information on the basin hydrology. We are now well advanced with the Project EIA and are in the final stages of selecting engineering consultants to deliver the Definitive Feasibility Study for the Project, the only brownfields lithium development in South America outside those of the major producers." Drilling is close to completion in the NW Sector with holes CAU28 and CAU29 (refer to Figure 1) completed since the last update on activities when CAU24 was completed. CAU28 and CAU29 extend the June 2018 resource area some 5 km further to the south and increase the area for the update of the NW Sector resource by approximately 20%. CAU28 and CAU29 are located 2.6 km and 5.1 km, respectively, south of CAU24. It should be noted that brine mineralisation is still open to the south in Advantage properties. These drill holes in the NW Sector have intersected an extensive sequence (over 300 m) of sand and gravel, which appears to have high porosity and permeability, making it attractive for future brine extraction. CAU23 is located in the NW Sector between holes CAU15 and CAU24. CAU25 and CAU27 have been completed along the eastern edge of the SE Sector. These holes were completed at depths of 427 and 473 m, respectively and intersected a sequence with some sandy material interbedded with halite and clay units. CAU19 has been completed in the southwest of the SE Sector to a depth of 519.5 m. This hole intersected the deep sand unit from 434 m to 519.5 m (a thickness of >86 m), with sandy units continuing at the end of the hole. CAU19 is close to the southern boundary of the property and confirms the extension of the deep sand into this area. The constant rate pumping test is currently underway on test production well CAU11 in the SE Sector, following completion of a variable rate test to confirm the pumping rate for the constant rate test. The constant rate test has been underway for 19 days and will continue until at least November 25. Brine concentrations are monitored throughout the test, in addition to water levels in the pumping well and a network of surrounding observation wells. The final preparations are currently underway for the CAU07 pumping test in the NW Sector. Proposals were received from four international engineering companies in response to a request for proposal by the company for the Definitive Feasibility Study ("DFS") engineering for all aspects of the company's Cauchari project. The company is in the final stages of selecting one of these companies for the DFS engineering. The company and consultants continue to advance the Environmental Impact Assessment, with preparation of key chapters for the EIA document underway.